Efficiency, productivity, streamlined, maintenance . . . buzzy buzzwords that can keep our butts in the chairs and us writing our hearts out. However, sometimes, The Girls in the Basement (our inner muses) send up something that seems just . . . useless. For almost two years, my mind has been pre-occupied with David Bowie and the ukulele. I’ve written two short stories and worked on a longer piece thanks to the David Bowie obsession, but the uke? It hasn’t paid off – except I love doing it, and it’s brought me a lot of joy and feelings of achievement. As hobbies and obsessions go, you can’t ask for much more than that, really. However, my upper mind – the Censor in the Attic, perhaps – is terribly concerned that I should be Writing, and not just any old writing, but Great and Wonderful Stories that Will Enchant the Masses (or at least a few Niches). It’s almost a daily battle between the Censor, who wants to direct things, and the Girls, who just want to have fun. Sadly, as is often the case in war, neither side wins on many days. But this week, I stumbled upon a 2016 Atlantic piece that soothed my censor a little bit. Ed Yong’s “Rock-Smashing Monkeys Unintentionally Make Sharp Tools” really resonated all over for me. There is a tricky problem of free will versus pre-determination in here. Are we wired to pound rocks together? Or pound keyboards, for that matter? And does that mean, only creatures with the right wiring can and will pound a rock? Or pound out a story? Well, there’s really only one way to find out. If you don’t pound the rocks, you don’t know if you’ll be the lucky hominid who discovers the Ginsu knife ancestor. And, honestly, if we’re fed and sheltered, is it so bad to pound the rocks for fun and happiness? I can think of worse hobbies. Pound away, and see where it leads! That’s the pep talk my girls are sending up these days, and the Censor agrees that it’s worth a shot. 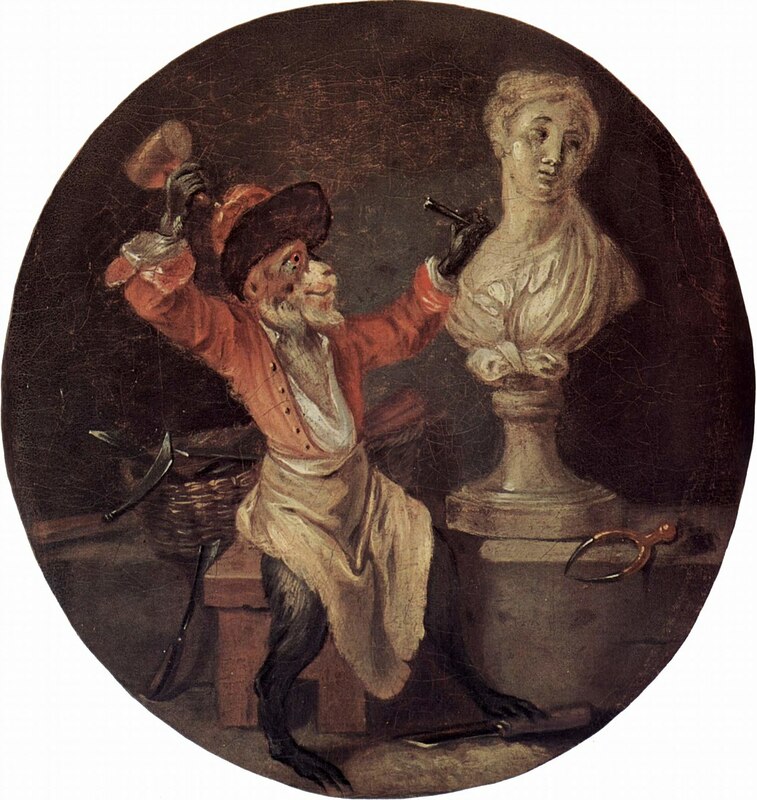 This entry was posted in Motivation and tagged butts in chairs, E.M. Duskova, evolution of a writer, follow your instincts, lucky hominids, Michaeline Duskova, rock-smashing monkeys, writing motivation. Bookmark the permalink. I can see it. A lot of hobbies are very similar. Not particularly practical, but fun to do in a group. And experiencing togetherness and joy can stimulate a lot of ideas. LOL, I think I’m working through some issues — rebelling against . . . what the hell am I rebelling against? Nobody is making me do anything. I’m free to have all the fun I want, and there is certainly no shortage of rocks to bang. In theory, anyway.